US President George W Bush says the insurgency in Iraq is part of a wider strategy by al-Qaeda and other Islamic militants to wage war against humanity. Mr Bush said militants wanted to establish a radical Islamic empire, stretching from Spain to Indonesia. 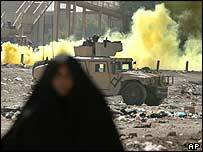 However, he added that it was a dangerous illusion to think the US would cut its losses in Iraq and leave. He also said at least 10 attempted attacks by al-Qaeda had been foiled since 9/11, three of them in the US. Asked what the al-Qaeda attacks were, Attorney-General Alberto Gonzalez highlighted the failed shoe bomb attack by Richard Reid, but said others remained classified. The White House cited two plots involving US citizens: an alleged plan by Jose Padilla to set off a radiological dirty bomb, and an attempt by Iyman Faris to sabotage the Brooklyn Bridge in New York. Speaking to the National Endowment for Democracy, the president called on Americans to be patient over the ongoing violence in Iraq. "Wars are not won without sacrifice and this war will require more sacrifice, more time and more resolve," he said. He went on to accuse Syria and Iran of aiding the Iraqi insurgency, and said Washington did not distinguish between those who committed acts of terrorism and those who supported or harboured the perpetrators. However, Mr Bush insisted that progress was being made in Iraq, saying recent wrangling over the constitution there was "the essence of democracy". US opinion polls suggest public support for the war in Iraq is waning. According to a CNN/USA Today/Gallup poll conducted in late September, just 32% of those surveyed approved of the president's handling of the conflict in Iraq. There has been a recent upsurge of violence in the country, which observers fear may worsen further ahead of the planned 15 October referendum on the draft Iraqi constitution. 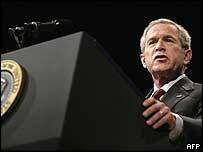 In his speech, Mr Bush conceded that Iraq was falling into the hands of al-Qaeda militants, and stressed that was why the US needed to stay put. "Those who think we can cut our losses and leave now are under a dangerous illusion. Would the US be less or more safe with Zarqawi and Bin Laden in charge of Iraq and its people?" Mr Bush said the insurgency in Iraq was part of a much wider strategy by al-Qaeda and other Islamic militants to end US influence in the Middle East and use the subsequent vacuum to try to topple governments. Mr Bush identified Egypt, Jordan and Pakistan as countries where the militants believed they could eventually seize control. The president insisted that the only way to bring a lasting peace to Iraq would be to stay the distance. "This enemy considers every retreat of the civilised world as an invitation to greater violence. In Iraq there is no peace without victory. We will keep our nerve and we will win that victory," he said. Correspondents say the high-profile speech made at the Washington-based think-tank is part of an attempt by Mr Bush to win back support for his administration's handling of the conflict in Iraq. According to the recent CNN/USA Today/Gallup poll, 59% of those surveyed now consider the US-led invasion of Iraq in 2003 a mistake and 63% of respondents said they wanted to see some or all US troops withdrawn. A Newsweek poll released on Saturday suggests that Mr Bush's overall approval rating has dropped to 40% as a result of his much criticised handling of Hurricane Katrina, as well as the ongoing problems in Iraq.